92 min. Not Rated in the U.S.
Man vs. Man and Nature vs. Man are the primal protagonists in Valhalla Rising, a brutal, yet thoughtful, re-envisioning of the Viking saga. Pagan Celts, Norsemen, and newly-converted Christian Vikings of the Scottish Highlands clash when each claims to have God(s) on their side in 1000 A.D. But the wind, mist, mud, and mountains of the Old, and then into the New, Worlds are relentless adversaries to their imperialism and evangelism. While Danish-born/New York raised director Nicolas Winding Refn proudly proclaims he had never read a Viking saga, he co-wrote the script with renowned Norwegian novelist Roy Jacobsen, author of Frost, an epic Viking novel (that hasn't yet been translated into English). But he has seen a lot of movies with the cinematic icon of the lone, hulking Man With No Name—like John Ford's cowboys, who influenced Akira Kurasawa's samurais, who Sergio Leone exaggerated in spaghetti Westerns, starring Clint Eastwood who has himself re-interpreted the legend. This Northern medieval iteration is embodied in one-eyed, mute, and heavily tattooed Mads Mikkelsen (the Danish star says he grew up with Viking lore), whose mythic quest of tortured body and soul is vividly seen over six chapters. While his red-drenched dreams of a vague past could just as well be from Mars as Scandinavia, in "Part 1 – Wrath" he has been chained in slavery for years by Scots tribal chieftain Barde (Alexander Morton; he and all the other adult actors are Scottish). He is let out of his cage for extreme fight matches that earn the chief the means to repay heavy debts. (With no depth perception, hand against hand combat is more effective than wielding weapons, but he's scary with an axe.) The only person who doesn't treat the smoldering brute like an animal is a blond boy captive servant (Maarten Stevenson), who names him One-Eye and warns challengers that he probably came straight outta hell. When One-Eye wreaks gruesome havoc to escape, he spares The Boy and grudgingly considers helping him get home, wherever that is for either of them. In "Part 2 – Silent Warrior", they wander through misty mountains riven with vengeful attackers and sacked villages. But as the Andrei Tarkovsky-like landscape fills with crosses, they meet up with a tribe of new converts the Scots had warned them about, "Christ-followers" who "drink the blood and eat the corpse of their god." Their fervent leader Kare (Gary Lewis) thunders that all sins will be absolved for those who join with him and his sons on a crusade to save the Holy Land from heathens. Whether they are seeking home or salvation, One-Eye and The Boy embark in "Part 3 – Men of God" on a ship that soon feels like it is sailing into Joseph Conrad's Heart of Darkness on a preternaturally calm sea. A rising wind brings up a dense fog full of nature sounds like the buzzing of insects (amplified by ominous music by Peter Kyed and Peter-Peter, the director's frequent scorer). The Christians pray in a red glow, but the heavy blue mist blinds them for 40 days (a very Biblical time span). Without fresh water, some of the new Christians become even more crazed than the paranoid passengers in Alfred Hitchcock's Lifeboat, and quickly ditch their faith to superstitiously blame The Boy. But they arouse One-Eye's protective ire, a hint that he is evolving to be capable of altruism. From this visually imaginative setting, "Part 4 – Holy Land" brings them to an intellectually imaginative premise – that the Vikings arrived on the North American continent as misguidedly as Columbus did further south, where he thought he had found the Indies. As the Christians only gradually realize this forest is not the Holy Land they expected, the evangelist declares it a New Jerusalem, just as early imperialist preachers laid down the philosophical justification for Manifest Destiny. "Part 5 – Hell", marked with funeral pyres and starvation, and "Part 6 – The Sacrifice" further explore the wild terrain and each pilgrim's very individual reaction to suffering the slings and arrows of outrageous fortune as shot by implacable natives who spurn physical or spiritual conquest. (Handsome Jamie Sieves, who also co-starred with Mikkelsen in Lone Scherfig's considerably more light-hearted Wilbur Wants To Kill Himself, is unrecognizable covered in mud and more as Gorm.) The conclusion feels very much like epic destiny. While the opening chapter recalls Ridley Scott's Gladiator, that revived this sword-and-sandals genre, the internecine violence and father/son themes defining manhood resonate from the earlier Refn/Mikkelsen collaboration in the gritty Pusher films. 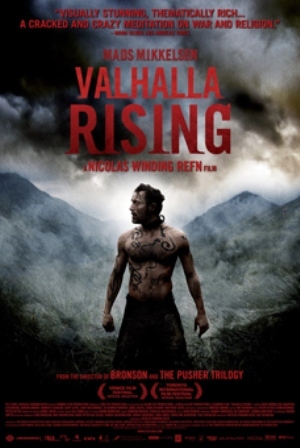 Though a bit ponderous and pompous, Valhalla Rising is considerably more provocative than Mikkelsen's Hollywood battling of mythological beasts in Clash of the Titans, and powerfully showcases his non-verbal acting skills. While the film is available on demand, Mikkelsen, the striking imagery and evocative landscapes should be seen in the dark and on a large screen.